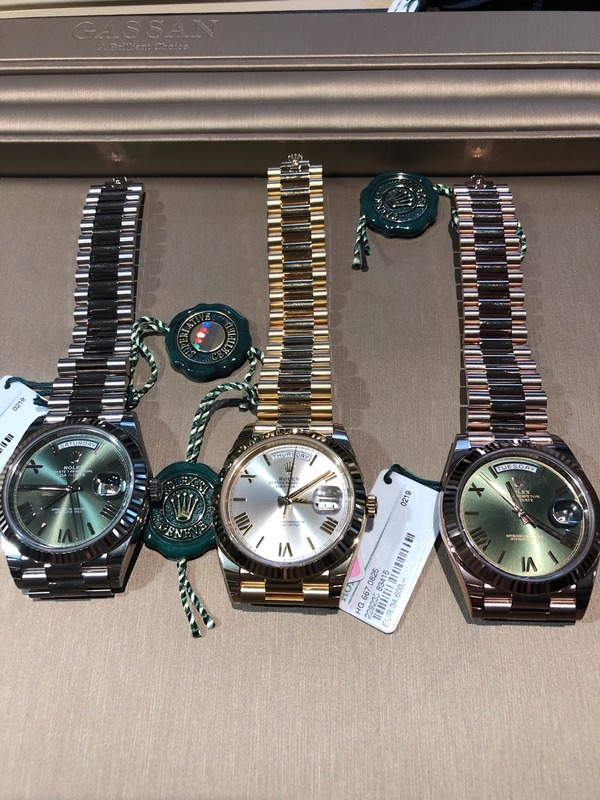 Today I visited our local AD and they just received a shipment from Rolex. But whatever steel models they had received, they were all sold within a couple of hours and when I walked in to the store it was packed. They only had a tow tone skydweller, a white gold submariner and a explorer I. 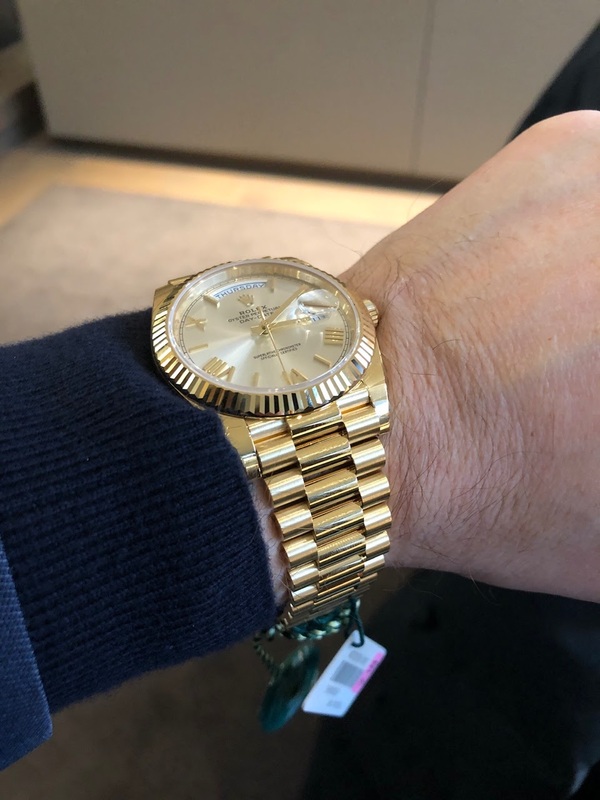 Now that it has become impossible to buy a steel sports model from Rolex I have started looking at full gold Rolex models. I used to have a white gold Day Date II with the black arabic dial but I sold it to get funds for another watch. But the Day Date in 40 mm looks much more balanced. So I am thinking about buying one. But which one? I like them all (see picture), but i can only afford one. Which one should it be. Your input is much appreciated! on yr pix the WG is the winner! Want. No steel, well ok then I’ll buy a gold one ? WG Green Dial for me! 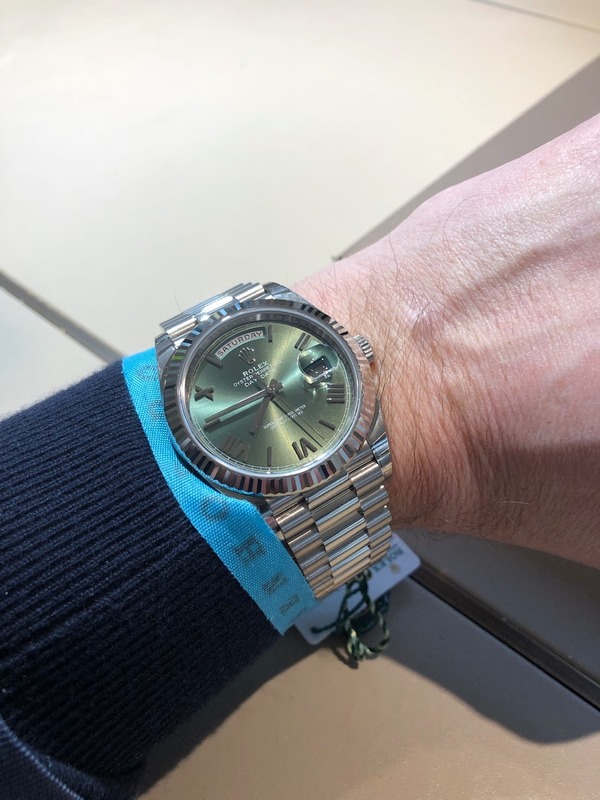 if we compare between the 40mm vs 36mm - then the bracelet of 40 will do better... i'm highly doubtful Rolex will upgrade the 36mm bracelet but with Rolex you never know ! BTW, I think she is right about the the white. You should see it on a summer day in The sunshine - it will make you smile from ear to ear. Or the diagonal motif on the YG. The Roman numerals just don’t do it for me. odds are pretty good that Rolex will upgrade the 36mm Day-Date with the new movement and bracelet this year. Maybe wait to after Basel to make any decisions. The new PMs in 36mm should not be hard to obtain soon after the fair. I am a big fan of sticks with lume and do not like the "Broken Romans" at all, so I would pass on those three. If you want the 40, get the yellow gold with the champagne stick dial. Would you consider trading (and paying a little extra) a Patek Philippe Aquanaut for a Day Date? WG green looks too plain. 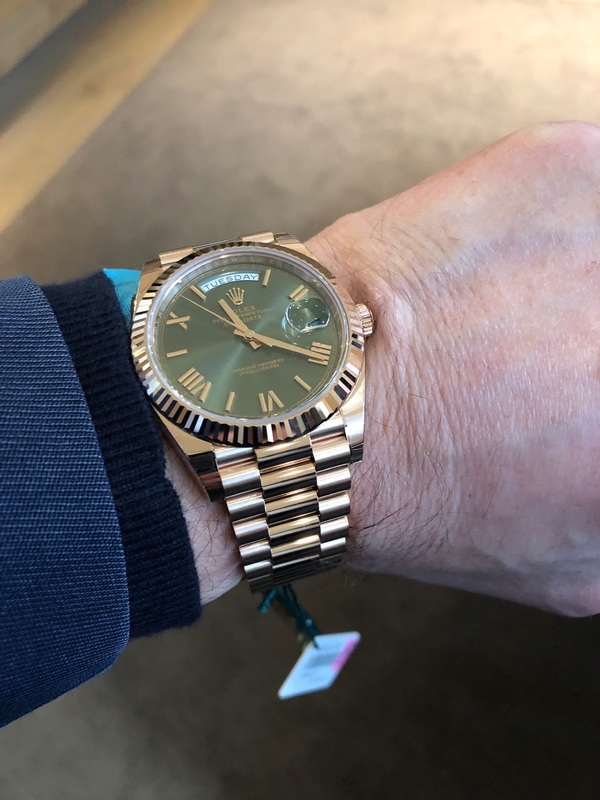 YG - it has to be in White Dial for me, I agree on the comment about “Broken Romans” which is a pity that Rolex rolled out in this model. I’m still a big fan of the stick index with lume.